Criticism of Holocaust denial criticizes claims to the effect that the genocide of Jews during World War II in the Holocaust did not occur in the manner or to the extent described by current scholarship. Key elements of such claims are the rejection of any of the following: that the Nazi government had a policy of deliberately targeting people of Jewish ancestry for extermination as a people; that between five and seven million Jews were systematically killed by the Nazis and their allies; and that genocide was carried out at extermination camps using tools of mass murder, such as gas chambers. The methodologies of Holocaust deniers are based on a predetermined conclusion that ignores extensive historical evidence to the contrary. A number of parties have challenged Holocaust denial claims as being based upon flawed research, biased statements, and deliberately falsified evidence. Courts of law have also rejected Holocaust denial claims (see Fred A. Leuchter and David Irving). The Nizkor Project, a group opposed to Holocaust denial claims, analyzes these claims for instances where the evidence used by Holocaust deniers has been altered or manufactured. Critics of Holocaust denial assert that there is much material which shows that it is unreasonable to claim that the absence of a written order means there was no policy of genocide. These include sources which reveal Hitler's desire to eradicate Jewry, and that the order to do this when he attained power did indeed originate from him. In a letter dated 1919 Hitler mentions that part of the ultimate aim of a strong national government must "unshakably be the removal of the Jews". And we say that the war will not end as the Jews imagine it will, namely with the uprooting of the Aryans, but the result of this war will be the complete annihilation of the Jews. Today I want to be a prophet once more: if international Jewish financiers inside and outside Europe again succeed in plunging the nations into a world war, the result will not be the Bolshevization of the earth and with it the victory of Jewry, but the annihilation of the Jewish race in Europe! Hitler's choice of language in German in the final phrase of this passage is "die Vernichtung der jüdischen Rasse in Europa" - unambiguously meaning "the extermination [or annihilation] of the Jewish race in Europe." In contrast to the T4 euthanasia program, no document written or signed by Hitler ordering the Holocaust has ever been found. Deniers have claimed that this lack of order shows genocide was not Nazi policy. When David Irving unsuccessfully sued Deborah Lipstadt for libel, he considered that a document signed by Hitler ordering the 'Final Solution' would be the only convincing proof of Hitler's responsibility, yet was content to accuse Winston Churchill responsible for ordering the assassination of General Sikorski, despite having no documentary evidence to support this claim. Mr Justice Gray concluded that this was a double standard. Historian Peter Longerich states that Hitler "...avoided giving a clear written order to exterminate Jewish civilians." Wide protest was evoked when Hitler's authorisation of the T4 program became public knowledge in Germany, and he was forced to put a halt to it as a result (nonetheless it still continued discreetly). This made Hitler realise that such undertakings must be done secretly in order to avoid criticism. Critics also point out that if Hitler did sign such an order in the first place, it would have been one of the first documents to be destroyed." This diary contains numerous other references to the mass extermination of Jews, including how "tens of thousands of them are liquidated" in eastern occupied territory, and that "the greater the number of Jews liquidated, the more consolidated will the situation in Europe be after this war." When speaking about this document under oath, David Irving is quoted as saying "There is no explicit reference...to the liquidation of Jews" and critics of Holocaust denial consequently state that it is dishonest to say such a thing when it is entirely contradicted by the diary of one of Hitler's closest associates. David Cole has previously stated that those who consider themselves revisionists have yet to provide an adequate explanation of this document. For more details on this topic, see Posen speeches#Holocaust denial. Argument: Nazis did not use gas chambers to mass murder Jews. Small chambers did exist for delousing and Zyklon-B was used in this process. There have been claims by Holocaust deniers that the gas chambers which mainstream historians believe were for the massacre of civilians never existed, but rather that the structures identified as gas chambers actually served other purposes. These other purposes include cadaver storage, delousing, and disinfection. A similar argument is sometimes used that claims gas was not used to murder Jews and other victims, and that many gas chambers were also built after the war just for show. A document advancing this theory is the Leuchter report by Fred A. Leuchter, a paper stating that only traces of cyanide were found when he examined samples taken from one of the Auschwitz gas chambers in 1988. This is often cited as evidence that gas was not used in the chambers, as no trace amounts remain. Despite the difficulty of finding traces of this material 50 years later, in February, 1990, Professor Jan Markiewicz, Director of the Institute of Forensic Research in Kraków, redid the analysis. Markiewicz and his team used microdiffusion techniques to test for cyanide in samples from the suspected gas chambers, from delousing chambers, and from control areas elsewhere within Auschwitz. The control samples tested negative, while cyanide residue was found in high concentrations in the delousing chambers, and lower concentrations in the homicidal gas chambers. This is consistent with the amounts required to kill lice and humans. Leuchter's comment that the camp was "untouched" has been dismissed as nonsense by the Holocaust scholar Robert Jan van Pelt, who explains that the absence of most of the would-be rubble from the crematoria is because the local Polish population returning to the area after the war rebuilt farmhouses to the west with bricks salvaged from rubble in the camp area including from the Birkenau crematoria. Near those crematoria is a pile of broken bricks thrown aside in the search for usable intact bricks. Another piece of evidence Holocaust deniers frequently question is what happened to the ash after the bodies were cremated. The amount of ash produced in the cremation of a person is about a shoebox full, if done in a proper crematorium. However, eyewitness testimonies documented by Hilberg's The Destruction of the European Jews describe the burning process used in Treblinka, Sobibor, and Belzec to have carried out in multiple open-air grills where stacks of bodies were burned on top of metal bars. These grills were operated by burning piles of wood underneath. It has been questioned by Holocaust deniers if it would have been possible to burn hundreds of thousands of corpses using the method as documented by Hilberg, especially when the low efficiency of such burning process, the high amounts of wood required and the often windy weather conditions of the camps are taken into account. Aerial photographs of Auschwitz indicate that what appears to be ash produced in Auschwitz was piled into the nearby river and marsh, and there is well-documented evidence that other ash was used as fertilizer in nearby fields. Photographs of Treblinka taken by the camp commandant show what looks to be ash piles being distributed by steam shovels. "Hoss [Hoess] said in his confession that his men would smoke cigarettes as they pulled the dead Jews out of the gas chambers ten minutes after gassing. Isn't Zyklon-B explosive? Highly so. The Hoss confession is obviously false." Argument: The figure of six million Jewish deaths is an irresponsible exaggeration, and many Jews who actually emigrated to the Soviet Union, Britain, Israel and the United States are included in the number. The figure of "six million" (which refers only to Jewish victims, and is larger when counting the other ethnic, religious, and minority groups targeted for extinction) is often minimized by such claims to a figure of only one million deaths, or only three hundred thousand deaths. This argument is often met with criticism as the vast majority of scholar, institutions, and even Nazi officials have estimated that no less than five to six million Jews perished during the Holocaust, while some claim the number could possibly be even higher. With as many as 4.3 million Jewish victims' names collected by Yad Vashem only, numerous documents and archives discovered after the war gave meticulous accounts of the exterminations that took place at the death camps (such as Auschwitz and Treblinka). The Nizkor project conducted a thorough research about this claim as well, and found the number of Jewish death to be at least 5.65 million. Holocaust deniers argue that the multiple pre-World War II claims of precisely six million Jews facing extermination, like former New York Governor Martin Glynn's 1919 article The Crucifixion of Jews Must Stop!, suggests the reported death toll is inaccurate and was invented to fit propaganda. Harwood also claimed that Die Tat, a Swiss tabloid newspaper, published statistics that concluded the number of people who died in Nazi prisons and camps from 1939 to 1945 based on ICRC statistics was "300,000, not all of whom were Jews". The January 19, 1955 edition of Die Tat did indeed give a 300,000 figure, but this was only in reference to "Germans and German Jews" and not nationals of other countries. In a 1979 response to this pamphlet, the ICRC said that they have "never tried to compile statistics on the victims of the war", nor "certified the accuracy of the statistics produced by a third party", and state that the authors of such material have "falsified" both claims that the document originates from the ICRC and refers exclusively to Jews. —Françoise Perret, Comité International de la Croix-Rouge, to Jacob Gerwitz, August 22, 1975. In the 1978 official bulletin, the agency stated that its mission was to "help victims not count them", and questioned how they would have even been able to obtain such statistics had they wanted to, given that they were "only able to enter only a few concentration camps...in the final days of the war". The agency states that the figures used are "the number of deaths recorded by the International Tracing Service on the basis of documents found when the camps were closed", and accordingly bear no relation to the total death tolls, since the Nazis destroyed much documentation, and that many deaths occurred in camps where prisoners were generally not registered. The ICRC considers this misrepresentation as "propaganda", and because these claims regarding the ICRC were used for the defense of Ernst Zündel at his trial in 1985, critics state that despite the agency's attempts to demonstrate the truth, Holocaust deniers have continued to rely on ICRC based disinformation. Archives of the International Tracing Service (located in Bad Arolsen) responding to such misrepresentation can be found here. Similarly, Harwood wrote that the June 4, 1946 edition of Baseler Nachrichten, another Swiss newspaper, reported that “a maximum of only one and a half million Jews could be numbered as casualties. Harwood fails to mention that a later article in a later edition of the newspaper acknowledges that the previous article was incorrect, and 5,800,000 was an accurate number of victims. Critics cite this as an example of deniers using partial information to distort legitimate sources. Only in 1949 are postwar estimates employed, the figures given are for estimates made in 1948. A year or two lag seems to be common for various other population estimates given by the World Almanac. The difference between the 1938 and 1948 figures is thus 4,481,491. In 1949, however, the World Almanac gives a revised 1939 population of 16,643,120 giving a difference of between 1938 and 1947 of 5,376,520. Where the extra population between 1938 and 1939 came from is not cited, though one might speculate that it was based upon the Nazi estimates made in 1942 for the Wannsee Conference. Despite the apparent exactness of the numbers listed, the World Almanac warns that all numbers listed are estimates. The Nazis used figures of between 9 and 11 million for the Jewish population of Europe, as evidenced in the notes of the Wannsee Conference. In fact, the Nazis methodically recorded the ongoing reduction of the Jewish population, as in the Korherr Report, which gave the status of the Final Solution through December, 1942. The Höfle Telegram was sent by SS-Sturmbannführer Hermann Höfle on January 11, 1943 to SS-Obersturmbannführer Adolf Eichmann in Berlin and detailed the number of deaths of Jews in the concentration camps. In the year 1942 alone, the telegram lists 1,274,166 Jews were exterminated in the four camps of Aktion Reinhard. The Korherr Report compiled by an SS statistician, gave a conservative total of 2,454,000 Jews deported to extermination camps or killed by the Einsatzgruppen. The complete status reports of the Einsatzgruppen death squads were found in the archives of the Gestapo when it was searched by the U.S. Army, and the accuracy attested to by the former Einsatzgruppen members who testified during war crime trials and at other times. These reports alone list an additional 1,500,000 or so murders during mass shootings, the vast majority of these victims were Jews. Further, surviving Nazi documentation spells out their plans to murder the Jews of Europe (see the Wannsee Conference), recorded the trains arriving at various death camps, and included photographs and films of many atrocities. Holocaust denial is generally viewed as antisemitic: the Encyclopedia of Genocide and Crimes Against Humanity, for example, defines Holocaust denial as "a new form of anti-Semitism, but one that hinges on age-old motifs", the Anti-Defamation League has stated that "Holocaust denial is a contemporary form of the classic anti-Semitic doctrine of the evil, manipulative and threatening world Jewish conspiracy" and French historian Valérie Igounet has written that "Holocaust denial is a convenient polemical substitute for anti-semitism." In 2005, the European Monitoring Centre on Racism and Xenophobia (now the Fundamental Rights Agency) published a "working definition" of antisemitism that included "[d]enying the fact, scope, mechanisms (e.g. gas chambers) or intentionality of the genocide of the Jewish people at the hands of National Socialist Germany and its supporters and accomplices during World War II (the Holocaust)". Harold Covington (the leader of the National Socialist White People's Party) sent a letter on July 24, 1996 via email to a number of neo-Nazi supporters (many of whom were Holocaust deniers). In this message, Covington explained Holocaust denial in a manner that has been used by its opponents and critics as a definitive answer to the question, "Why do people deny the Holocaust?" ...I was asked whether the fact that a person denies the existence of gas chambers does not prove that he is an anti-Semite. I wrote back what every sane person knows: no, of course it does not. A person might believe that Hitler exterminated 6 million Jews in some other way without being an anti-Semite. Since the point is trivial and disputed by no one, I do not know why we are discussing it. In that context, I made a further point: even denial of the Holocaust would not prove that a person is an anti-Semite. I presume that that point too is not subject to contention. Thus if a person ignorant of modern history were told of the Holocaust and refused to believe that humans are capable of such monstrous acts, we would not conclude that he is an anti-Semite. The primary motivation for most deniers is anti-Semitism, and for them the Holocaust is an infuriatingly inconvenient fact of history. After all, the Holocaust has generally been recognized as one of the most terrible crimes that ever took place, and surely the very emblem of evil in the modern age. If that crime was a direct result of anti-Semitism taken to its logical end, then anti-Semitism itself, even when expressed in private conversation, is inevitably discredited among most people. What better way to rehabilitate anti-Semitism, make anti-Semitic arguments seem once again respectable in civilized discourse and even make it acceptable for governments to pursue anti-Semitic policies than by convincing the world that the great crime for which anti-Semitism was blamed simply never happened— indeed, that it was nothing more than a frame-up invented by the Jews, and propagated by them through their control of the media? What better way, in short, to make the world safe again for anti-Semitism than by denying the Holocaust? ↑ 1.0 1.1 Donald L Niewyk, The Columbia Guide to the Holocaust, Columbia University Press, 2000, p.45: "The Holocaust is commonly defined as the murder of more than 5,000,000 Jews by the Germans in World War II." Estimates by scholars range from 5.1 million to 7.8 million. See appropriate section of the Holocaust article. ↑ 6.0 6.1 6.2 6.3 6.4 "Learning Tools : Myth/Fact Sheets : Hitler never ordered the Holocaust". HDOT. http://hdot.org/en/learning/myth-fact/hitlerorder.html. Retrieved 2014-03-22. ↑ "Dokumente zum Nationalsozialismus : Hitlers "Gutachten zum Antisemitismus"" (in de). Ns-archiv.de. http://www.ns-archiv.de/verfolgung/antisemitismus/hitler/gutachten.php. Retrieved 2014-03-22. ↑ "''BBC/OU Open2.net - History - Lecture transcript''". Open2.net. http://www.open2.net/historyandthearts/history/lecture_transcript.html. Retrieved 2014-03-22. ↑ Hell, Josef. "Aufzeichnung", 1922, ZS 640, p. 5, Institut für Zeitgeschichte, cited in Fleming, Gerald. Hitler and the Final Solution. Berkely: University of California Press. 1984. p. 17, cited in "Joseph Hell on Adolf Hitler" at the Wayback Machine (archived June 3, 2008), The Einsatzgruppen. ↑ "The Holocaust," by Martin Gilbert, Holt, Rinehart and Winston, NY, 1985, p. 285., cited in "Statements by Leading Nazis on the "Jewish Question"
↑ Dawidowicz, Lucy S.; Altshuler, David A. (1978). Hitler's war against the Jews. Behrman House, Inc. p. 190. ISBN 0-87441-222-6. ↑ Kaes, Anton; Jay, Martín; Dimendberg, Edward.. The Weimar Republic sourcebook. University of California Press. p. 806. ISBN 0-520-06775-4. ↑ "''Adolf Hitler on the Jewish Question (Reichstag, 1939 January 30)''". Holocaust-history.org. 1939-01-30. http://www.holocaust-history.org/der-ewige-jude/hitler-19390130.shtml. Retrieved 2014-03-22. ↑ "The Irving Quote". Nizkor.org. http://www.nizkor.org/hweb/people/g/goebbels-joseph/goebbels-1948-excerpts-02.html#full-irving-quote. Retrieved 2014-03-22. ↑ 23.0 23.1 23.2 23.3 23.4 "Who is David Irving?". Holocaust-history.org. http://www.holocaust-history.org/pamphlets/irving/pamphlet.shtml. Retrieved 2014-03-22. ↑ "David Cole's Letter". Nizkor.org. http://www.nizkor.org/ftp.cgi/people/c/cole.david/cole-vs-faurisson-struthof. Retrieved 2014-03-22. ↑ "The Trial of Adolf Eichmann, Session 104". Nizkor.org. http://www.nizkor.org/hweb/people/e/eichmann-adolf/transcripts/Sessions/Session-104-05.html. Retrieved 2014-03-22. ↑ "Letter to Irving, 8/9/96 (part 1)". Nizkor.org. 1996-08-09. http://www.nizkor.org/hweb/people/i/irving-david/correspondence/mccarthy-to-irving-960809-01.html. Retrieved 2014-03-22. ↑ "Where did David Irving go wrong?". Holocaust-history.org. http://www.holocaust-history.org/irving-wrong/. Retrieved 2014-03-22. ↑ Ezard, John (17 February 2001). "Germans knew of Holocaust horror about death camps". http://www.theguardian.com/uk/2001/feb/17/johnezard. Retrieved 16 November 2013. ↑ Konnilyn G. Feig (1981). Hitler's death camps: the sanity of madness. Holmes & Meier. ISBN 0841906750. http://www.amazon.com/Hitlers-Death-Camps-Sanity-Madness/dp/0841906769. ↑ "Proving the Gas Chambers & Crematoria". The Nizkor Project. http://www.nizkor.org/hweb/orgs/american/skeptic-magazine/skeptic-12.html. Retrieved 16 November 2013. ↑ "A Study of the Cyanide Compounds Content in the Walls of the Gas Chambers in the Former Auschwitz & Birkenau Concentration Camps". Nizkor.org. http://www.nizkor.org/hweb/orgs/polish/institute-for-forensic-research/. Retrieved 2014-03-22. ↑ "A Study of the Cyanide Compounds Content in the Walls of the Gas Chambers in the Former Auschwitz & Birkenau Concentration Camps". Nizkor.org. http://www.nizkor.org/hweb/orgs/polish/institute-for-forensic-research/table-seven.html. Retrieved 2014-03-22. ↑ in the words of Leuchter, "No holes — no Holocaust"
↑ Morris, Errol (2006). "Mr. Death: Transcript". http://www.errolmorris.com/film/mrd_transcript.html. Retrieved 2008-08-07. ↑ "Trials of German Major War Criminals: Volume 20". Nizkor.org. http://www.nizkor.org/hweb/imt/tgmwc/tgmwc-20/tgmwc-20-197-10.shtml. Retrieved 2014-03-22. ↑ "Answers to the 66 Questions of Holocaust Deniers". Jewishvirtuallibrary.org. https://www.jewishvirtuallibrary.org/jsource/Holocaust/denial1.html. Retrieved 2014-03-22. ↑ "Holocaust facts: Where does the figure of 6 million victims come from?". August 11, 2013. http://www.haaretz.com/jewish-world/jewish-world-features/.premium-1.540880. Retrieved 8 November 2013. ↑ "Responses to common Holocaust-denial claims". ADL. 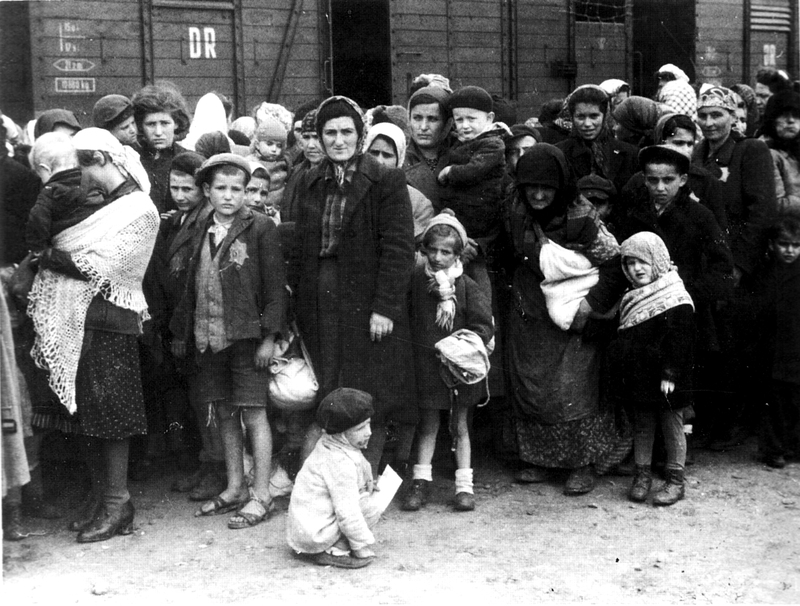 http://archive.adl.org/holocaust/response.asp. Retrieved 8 November 2013. ↑ Martin Gilbert (2002). The Routledge atlas of the Holocaust, 3rd Ed.. London: Routledge. p. 245. ISBN 0-415-28145-8. "By the most exact estimates of recent research, the number of Jews killed in Europe between September 1939 and May 1945 was nearly six million. This estimate is a minimum; the deaths shown opposite total just over 5,750,000, and are based on such country-by-country and region-by-region records as survive." ↑ "The Horrifying New Holocaust Discoveries". October 18, 2013. http://www.jewsnews.co.il/2013/10/18/the-horrifying-new-holocaust-discoveries/. Retrieved 8 November 2013. ↑ "Central Database of Shoah Victims’ Names". http://www.yadvashem.org/yv/en/about/hall_of_names/what_are_pot.asp. Retrieved 17 September 2014. ↑ "COMBATING HOLOCAUST DENIAL: EVIDENCE OF THE HOLOCAUST PRESENTED AT NUREMBERG". United States Holocaust Memorial Museum. http://www.ushmm.org/wlc/en/article.php?ModuleId=10007271. Retrieved 8 November 2013. ↑ "What proof exists that the Nazis practiced genocide or deliberately killed six million Jews?". Nizkor Project. http://www.nizkor.org/features/qar/qar01.html. Retrieved 3 December 2013. ↑ Hilberg, R. Op. Cit. ↑ Dawidowicz,L., The War Against the Jews. New York: Bantam Books, (1979) p. 191. ↑ Proctor, Robert N. (2000). The Nazi War on Cancer. Princeton University Press. p. 11. ↑ 63.0 63.1 Lipstadt, p. 117. ↑ 64.0 64.1 64.2 "Comite International De La Croix-Rouge". Nizkor.org. http://www.nizkor.org/ftp.cgi/orgs/international/red-cross/ftp.py?orgs/international/red-cross//300000-victims.response. Retrieved 2014-03-22. ↑ Cited in Lipstadt, Denying the Holocaust, p. 117. ↑ 66.0 66.1 66.2 66.3 66.4 ICRC Bulletin No. 25, Feb. 1, 1978, cited in Lipstadt, p. 117. ↑ "Archives". Its-Arolsen.Org. http://www.its-arolsen.org/en/archives/index.html. Retrieved 2014-03-22. ↑ Harwood, p. 14., cited in Lipstadt, p. 112. ↑ "The World Almanac Gambit", Deceit & Misrepresentation: The Techniques of Holocaust Denial, Nizkor Project website. Retrieved December 6, 2009. ↑ 72.0 72.1 Hanyok, Robert (2004). "Eavesdropping on Hell: Historical Guide to Western Communications Intelligence and the Holocaust, 1939-1945" (PDF). p. 80. http://www.nsa.gov/about/_files/cryptologic_heritage/publications/wwii/eavesdropping.pdf. Retrieved 2007-09-09. ↑ "How many People Died at Auschwitz", by Franciszek Piper, Article Review, Memorial and Museum Auschwitz-Birkenau, Note 24: Hoess testimony, March 11, 1947, The proceedings of the Supreme National Tribunal in Warsaw. ↑ How Reliable are the Hoss Memoirs? by John C. Zimmerman. Associate Professor, University of Nevada, Las Vegas. 11 February 1999. ↑ "The Nizkor Project - Command staff". Nizkor.org. http://www.nizkor.org/faqs/auschwitz/auschwitz-faq-10.html. Retrieved 2014-03-22. ↑ "Holocaust denial is a new form of anti-Semitism, but one that hinges on age-old motifs." Dinah Shelton, Encyclopedia of Genocide and Crimes Against Humanity, Macmillan Reference, 2005, p. 45. ↑ "Introduction: Denial as Anti-Semitism", Holocaust Denial: An Online Guide to Exposing and Combating Anti-Semitic Propaganda, Anti-Defamation League website. Retrieved August 27, 2009. ↑ Igounet, Valérie. "Holocaust denial is part of a strategy", Le Monde diplomatique, May, 1998. ↑ Working Definition of Antisemitism PDF (33.8 KB), European Fundamental Rights Agency, 16 March 2005. ↑ "On Revisionism" by Harold Covington (writing under the pseudonym Winston Smith), NSNet Bulletin #5, July 24, 1996. ↑ Rubinstein, William. Quadrant, October, 1981. ↑ "The Faurisson Affair: Noam Chomsky writes to Lawrence K. Kolodney Circa 1989-1991", Noam Chomsky website. Retrieved August 27, 2009. ↑ Reich, Walter. "Erasing the Holocaust", The New York Times, July 11, 1993. Richard J. Evans, Lying About Hitler: History, Holocaust, and the David Irving Trial, Basic Books, 2002 (ISBN 0-465-02153-0). Raul Hilberg. The Destruction of the European Jews (Yale Univ. Press, 2003, c1961). "Who Denies the Holocaust And Why Do They Deny It?". http://www.jewishmag.com/115mag/holocaustdeny/holocaustdeny.htm. Retrieved 2009-02-09.